Have the sharpest knife in the drawer with our overnight knife sharpening service. Drop off your knives at Kitchen Conservatory for expert sharpening and pick them up the next day, weekends included. (Knives shipped to us for sharpening will be returned UPS ground, starting at $12.00 shipping fee, based on weight.) Our wonderful knife sharpener can also repair broken or bent tips. Knives are sharpened on an electric water-cooled stone wheel to a 20-degree angle, unless otherwise requested. Have a well-loved -- yet well-worn -- knife that needs attention? 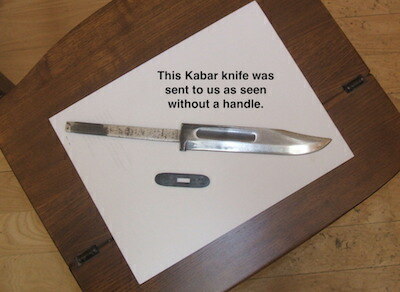 We also offer handle repair (wood or plastic handles, please specify), starting at $50 per knife. We strongly recommend never putting any knife in the dishwasher; knives and handles will last longer when carefully hand washed. 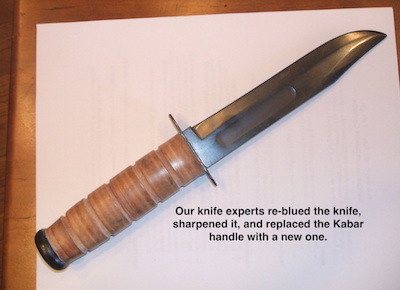 KA-BAR-style knife handle repair (with new leather washer rings) costs $90 per knife. Add $3 per knife for sharpening. (Knives shipped to us for repairs and/or sharpening will be returned UPS ground, starting at $9.00 shipping fee, based on weight.) Print form to send with knife. 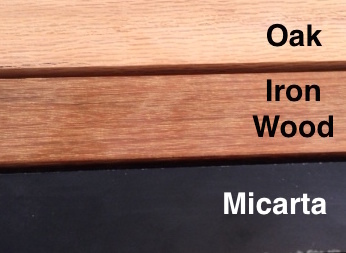 Choose from oak, iron wood, or micarta for a new knife handle.